After suffering from spinal trauma following a car accident, everyday activities like walking and even standing for more than a few minutes, became a struggle for Mark Begley. As an active biker and runner, he was concerned low back pain would prevent him from making a full recovery; but thanks to Orlando Orthopaedic Center’s Daniel M. Frohwein, M.D., and the minimally invasive lumbar medial branch neurotomy (also known as a “rhizotomy”) he performed, Mark is able to bike, run and exercise again without any pain. Mark met with Dr. Frohwein, a board certified anesthesiologist with subspecialty certification in pain management, several times to develop a treatment plan that would help him return to his active lifestyle without pain. 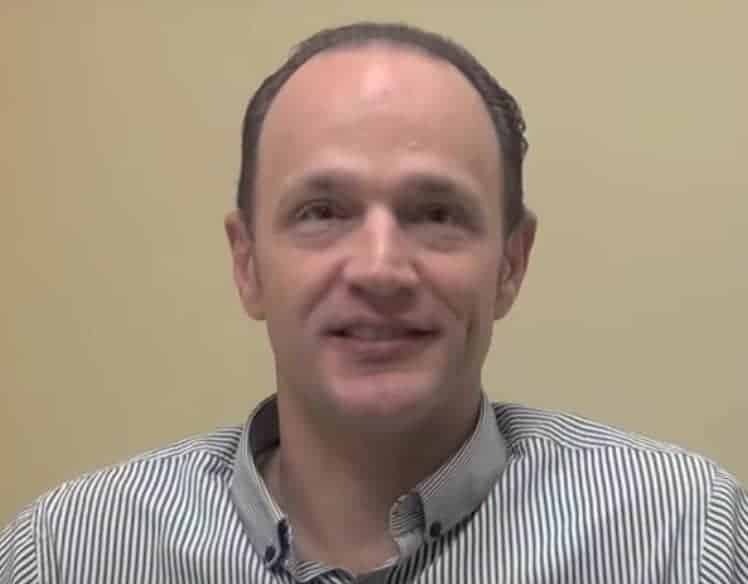 Dr. Frohwein proposed a minimally invasive lumbar medial branch neurotomy procedure after Mark successfully completed the test nerve blocks which predicted the procedure would be beneficial for him. “The minute I was done with the procedure, short of the pain from the actual procedure itself, I felt a difference,” says Mark. Four days later, he was back to work and able to continue the healing process pain-free. What is a Lumbar Medial Branch Neurotomy? The joints located at the back of the spine between the vertebrae are called facet joints, and their job is to prevent excessive or irregular motion. These joints are susceptible to damage or inflammation from normal wear and tear, osteoarthritis, spinal stenosis or, in Mark’s case, severe trauma caused by an accident. The nerves connecting these joints to the brain are called the medial branch nerves. A medial branch neurotomy is used to “disconnect” the nerves from sending pain signals to the brain and provide a long term treatment for relief of facet joint pain. During the procedure, patients will be positioned lying face down while the injection site is numbed. The physician will use a fluoroscope, or live x-ray image to visualize the spine and pin-point the location of the affected nerves. The entire procedure is performed through a needle placed along the nerves, which run along the outside of the vertebrae. A small electrical current is used to stimulate sensations in the nerves to ensure the accuracy of the procedure. Next, the targeted nerves are numbed and a radiofrequency pulse is used to heat the tissue around the tip of the needle, creating a heat lesion on the nerve to stop the transmission of pain signals to the brain. In most cases, the entire procedure only lasts about an hour and the patient can return home the same day. The effects of a lumbar medial branch neurotomy can last nine months to two years, allowing patients to introduce additional recovery techniques such as anti-inflammatory medication and physical therapy to create a healing environment for the facet joints without additional discomfort. Mark Begley says the minimally invasive lumbar medial branch neurotomy has changed his life. A majority of patients report significant pain relief and improved mobility following the procedure and can usually begin taking additional recovery steps within three to five days. For Mark the biggest benefit was being able to stand and walk again pain-free. “[It’s] just very simple things that a lot of people take for granted,” Mark recalls. As an extremely active runner and biker, Mark was finally able to return to the active hobbies he enjoys.